The city of Cienfuegos is located on the southern coast of Cuba and is dubbed the “Pearl of the South”. There are around 1,500 Neoclassical buildings here, a fortress used to defend against pirates in the 1700’s, one of the most important naval seaports, a long seafront promenade, and…a Spanish Flamenco Cultural Center. 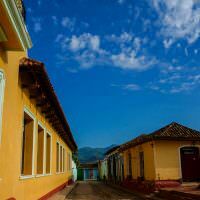 As a way to try to immerse ourselves into the Cuban lifestyle, get a good feel for the country, and experience home-cooked meals, we decided to stay in casa particulares (homestays) when we were travelling in Cuba. Not to mention, staying in casas really helped with our Cuba budget. 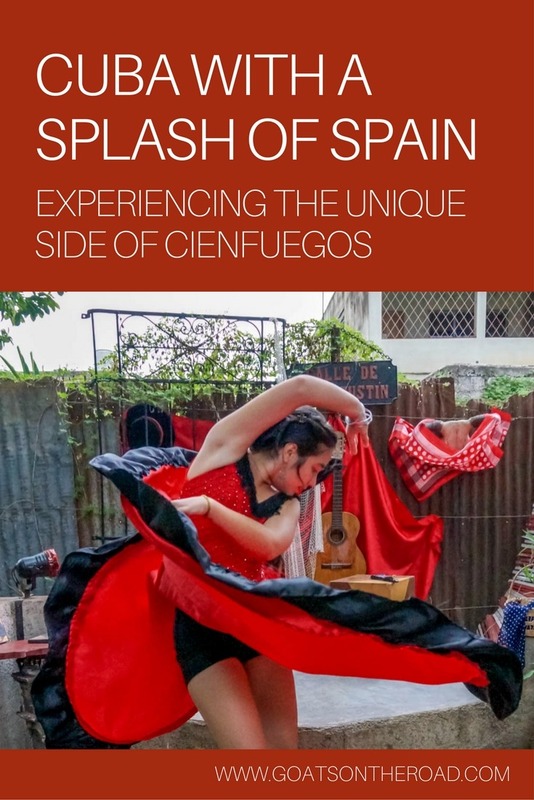 In the city of Cienfuegos, we stayed at El Patio Andalú, which was not only home to an awesome couple, but home to the Flamenco Cultural Center as well. 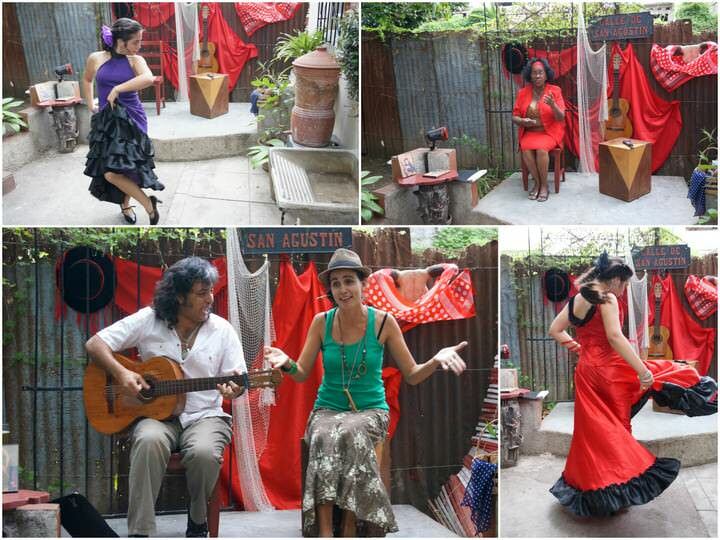 Of all the things we thought we would experience while backpacking Cuba, Spanish Flamenco culture was not one of them! As soon as we arrived at the guesthouse (which was just a two-minute walk from the bus station), we knew we would love it. Joel and Ivet were warm and welcoming, and they were also about our age, which added a whole other (fun) element to the stay. The two of them are some of the most creative people we’ve ever met! Joel is a chef, dancer, singer, musician and actor, while Ivet is a singer, painter and musician. 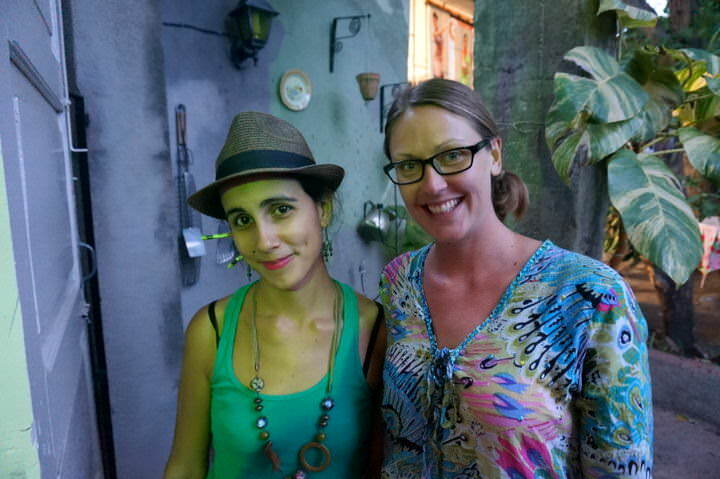 We really enjoyed our stay at Casa El Patio Andalu! Joel and Ivet were great hosts and the Flamenco aspect really added a unique element to our stay. Joel’s family was originally from the Andalusian coast in Spain and both he and Ivet have a soft-spot when it comes to the country. Joel has even travelled there in the past and can’t get enough of it. We lucked out and arrived at the hostal on a weekend, which is when the Flamenco performance, together with traditional dancing, singing and poetry takes place. There’s also a special food menu with items from the Andalusian region of Spain. The backyard garden area was decorated nicely with all things Spanish: a red cape (muleta), black sombrero hat, the skull of a bull’s head and other odds and ends. Flamenco is an interesting form of song and dance. Performers are very serious while dancing and very animated while singing. Feet stomping, hand clapping and finger snapping by the band, and audience, encourages dancers to excel! The evening was filled with traditional poetry, stunning dancing by a 14-year-old student of Flamenco, couple’s dancing with Joel and his student, and music and singing from our hosts, Joel and Ivet. Friends and neighbours came in for dinner and in typical Cuban fashion, started spontaneously singing, clapping their hands and creating a drumming beat on the table and chairs. Spanish wine was flowing, Cuban cigars were smoked and everyone was having a great time. 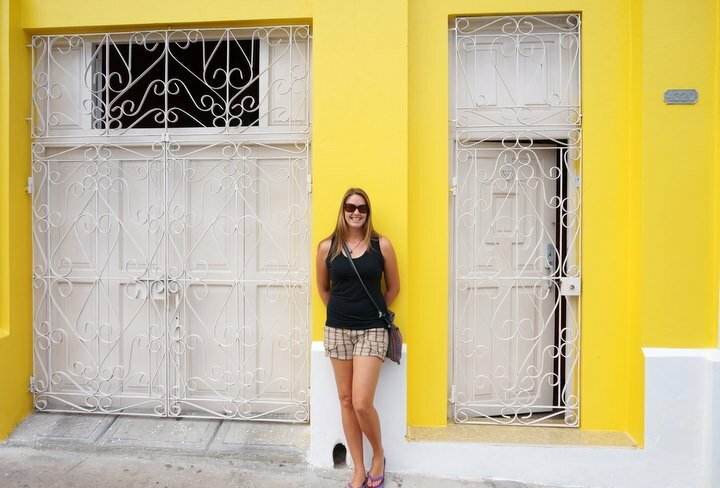 The colourful buildings in Cienfuegos were beautiful! 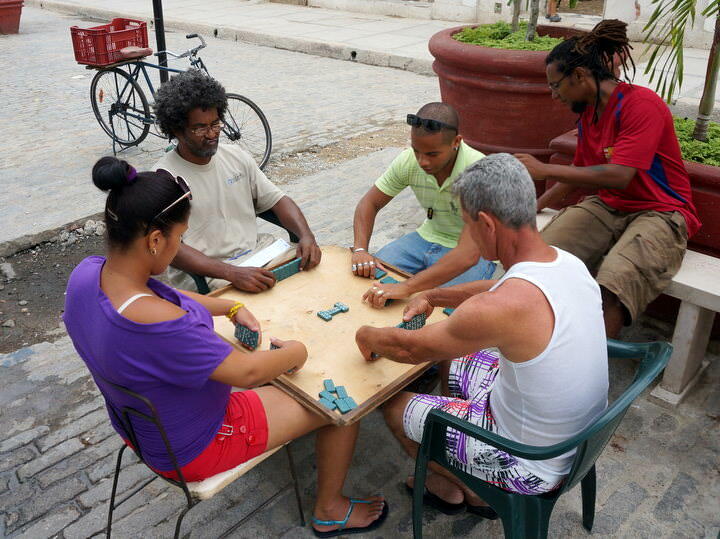 We ended up spending 4 nights in Cienfuegos and although we did visit some of the main sights, wandered down the pedestrian streets, enjoyed food by the sea and even found some bumper cars one afternoon, our main experience of the city was with Joel, Ivet, their young son and their friends. We hung out with them often, shared many meals and cigars together, and of course, lots of wine, beer and mojitos. Seeing the main attractions of a city or country is something that everyone wants to do (ourselves included). 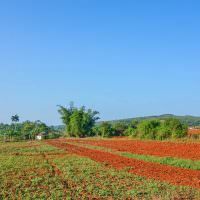 However, what makes a country tick are its people. Meeting the locals and learning about their culture will enrich your travel experience, create lasting memories and forge lifelong friendships. Isn’t that what travel is all about? We want to give a very big thanks to Joel and Ivet for making our visit to Cienfuegos a special one. We are still in contact with them today. Check out this very quick video of our Spanish night in Cuba! A special thanks to HostelsClub.com and to Joel & Ivet for being such amazing hosts and friends! Even if you’re not planning on staying here, we recommend stopping by for the Flamenco and for their mouth-watering Spanish menu 🙂 As always, all thoughts and opinions remain our own, despite any complimentary services received. It looks like Joel and Ivet were perfect, as well as very talented hosts who made for such a memorable trip. The flamenco dancing is a wonderful video and if I’m ever fortunate enough to make it to Cuba the experience of seeing Flamenco would be high on my list.